If you say this sounds gross, I’m with you…but can it for a minute, will ya? This recipe comes from my sister-in-law, and she got it from Recipezaar…if you know someone with cucumbers galore, or who loves to can, pass this recipe along. It’s a SUREFIRE hit! Peel, core, slice 1/3 inch thick and core out all seeds, leaving the cucumber in a ring. Soak in lime and 1 gallon water for 24 hours. Soak, covered with ice water for 3 hours. Mix 2 cup vinegar, food coloring, 1 tablespoon alum and enough water to cover. Pour over cucumbers and simmer for 2 hours. Bring to a boil 2 cups vinegar, 2 cups water, 12 cups sugar, cinnamon sticks and red hots. Pour over cucumbers and let stand for 24 hours. Pour syrup back into a large pot and bring to a boil. Put cucumbers in jars and pour hot syrup over cucumbers. Place 1 of the cinnamon sticks from the mixture in each jar. Process for 10 minutes in water bath for pints and 15 minutes for quarts. If you have a biscuit/donut cutter with a removable center, take it out and use it to core your cukes. I peeled my cucumbers with a vegetable peeler, sliced them and then used the donut hole cutter for removing the seeds. It left my cucumber slices in pretty rings! If your cucumbers are too small in diameter, you still might need to core them with a knife. Well, it’s a rainy and cool day here in the mid-west. I’ve been busy this week…processing bing cherries and cukes, for one thing, and organizing junk drawers and closets–one last fling at housekeeping before school starts! Speaking of school starting…we’ll be kicking off our homeschooling year next Thursday the 14th with our annual treasure hunt and craft day. I’ve been getting familiar with our new geography and science curriculums and trying to get six weeks worth of lesson plans written up for each girl. We’re sad to see summer go, but I think we’re all getting a little excited about school and fall activities starting up again! My mom made these and my family loves them. Her very picky neighbor kids think they are candy. I think they sound good! As far as school goes, I am getting ready for another year. Tristyn my 12 year old goes to a private school, so I just purchased his school supplies and uniforms today. Lauren and Megan homeschool, and I got their school supplies as well. I have been trying to get the lesson plans done as well. I only have the first week done so far. LOL We are not starting school until the 18th this year. I just follow the days that Tristyn’s school is in session. Well, good luck with the lesson plans! I think your annual treasure hunt and craft day sounds fun! What a great way to start the school year. I am ready for fall weather that is for sure…it is one of my favorite times of year. So you know exactly how good they are, Andrea! I finished mine up an hour ago…got 5 quarts and 3 pints. Mmm! Amy, they are unbelievably good! Plant a lot of cucumber plants this summer! Juli, I love fall too! We’re not starting our textbooks until the 18 either. I’m going to need the extra time, I’m afraid! I’m so glad to hear that you’re getting to homeschool again this year! Woo-hoo! Anything with the word pickle in it, I’m game! I love pickles and should really start making my own. My dad and I use to make them when I was younger. I might have to try this new idea! That would be a fun weekend project for you and SR, Colleen! What a neat memory to have of your dad! Hi Sandra, you just need to have hot jars (I heat mine up in the canner as I’m bringing the water to a boil, then use the jar lifter to get them out, discard the hot water that was in the jar into another handy kettle and you’re ready to fill up the jar with cucumber rings), and keep your lid flats and rings in a simmering saucepan of water. Fill the hot jars with the cucumbers and ladle the hot syrup over them–insert a cinnamon stick and then use a plastic knife to slide up and down around the edges, releasing air bubbles. Wipe the top of the jar with a damp clean cloth so that the lid flat will adhere, and fish the lid and ring out of the hot water with a fork or a magnet lifter. Screw the ring on tightly, not overtight, but not loose…then use your jar lifter to set the full jar back down in the canner of boiling water. Once you have the canner full, make sure an inch or two of water is covering each jar and then put the lid on and set the timer. Once the time is up, remove jars carefully to a cooling rack. You’ll hear the lids pinging as they seal. The next morning make sure all the jar lids sealed. If they didn’t, the lid flat will indent when you push on it. All of mine sealed very soon after removing them from the canner, some even while I was taking them out! Oh, and when you are filling the jars with syrup, leave between 1/4″ and 1/2″ headspace between the syrup and the top of the jar. Hope this helps, let me know if any of it was confusing…sometimes I tend to over-explain and make things worse! Good luck! I hope you try this, it’s such a fun treat! Do you use white of cider vinegar? I’m starting the recipe today so I have a day or so til I need to add the vinegar. I went overseas for my daughter’s wedding for 3 weeks and when I got back I had loads of overripe cukes. Thanks, Mary, for giving me a way not to throw them away! I used apple cider vinegar, actually, but as the recipe didn’t say, I doubt it matters much. I’ve read in my Stocking Up book that they both have the right level of acidity, etc. So glad you found us, and yes, this recipe is perfect for large, over-ripe cukes! Did you see I uploaded pictures? So glad for your comment, it was a good reminder that I hadn’t done that yet! I ended up getting 5 quarts and two pints out of this recipe, and I did make a little extra syrup to go the distance. Like another half a recipe. I wanted to get back to you about these pickles. Golly, it got complicated, and none of that was the fault of your directions. As usual, life interfered. A husband who couldn’t stand the smell of the vinegar, and schedule that couldn’t wait for the syrup to boil. So my brilliant mind said, I’ll boil this in the basement oven. Which did well for the 2 hours of cooking the pickles. So I decided to do it again for boiling the syrup. But I left the oven too high and was gone too long and when I returned the house smelled like marshmallows that had been roasted to a crisp! The turkey roaster I used may never been the same and boy do I wish my extra oven was a self cleaning. By then it was 11pm and the pickles had sat a few days already and needed their syrup. No more red hots! The local all night liquor store had atomic cinnamon pill shaped candies. The clerk assured me they were just like red hots, she ate them all the time. Not true, after I fished the gummy-candy-like pills out of a mixture that had boiled long enough to melt silver, I added some red food color and cinnamon and called the syrup good. And actually it does taste good. Whatever was on the coating of those atomic things had a good flavor, I guess. I did wonder why the pickles had to sit so long in the lime water. They seem to crisp up right away. And why add alum, when it too is a crisping agent? It was an adventure, mostly of my own making. I wish I’d taken photos of the monster black marshmallow in the oven! The jury is still out on these pickles, since my husband and daughter have both declined to try them. I tried and liked them. I got 11 pints and 2 quarts and yes extra syrup is a must. The larger extended family will be getting an interesting gift this Christmas! P.S. I used cider vinegar too, but I’m sure it didn’t matter! Oh MAN! I can’t imagine, but this is definitely one of those stories that you can only grit your teeth at “during” and hopefully laugh at “later”! Good night! I’m so sorry the hubby and daughter won’t give them a try! They are SOOOO good, even though they sound like they’d be too weird. What a story–sorry to say, very hilarious except when I think about it happening to ME! I’m glad you’re still willing to visit the site, lol! Better luck next time, if there will be a next time! I’m still getting a lot of cukes from the garden, and even though my pickling process went smoothly (no black marshmallow/basement oven experiences) I’m not excited about doing it all over again. I wish I knew why they had to soak so long? Anyway, glad you survived the cinnamon cuke experience! Whew, Ok…I tried these and some where I ran a muck…I only got three pints of pickles and I had tons of syrup left. In addition, the pickles/cucumbers were mushy, kind of like jellied, if you will. WHAT DID I DO WRONG???? It seemed that simmering them for two hours was way too much and perhaps why they were mushy…but every recipe I’ve read says to simmer them for 2 hours. ANY HELP and/or suggestions would be helful. We love these little devils and I’d sure like to be able to master this recipe. Thank you in advance for any help you are able to provide. I’m at a loss too, as to what could have gone wrong. Did you use the large over-ripe cucumbers? The lime soak is what makes them crunchy. I can’t imagine why you would have only gotten 3 pints! I got over 5 quarts. I’m so sorry…I know it’s a ton of steps to have it all for nothing. I do know that mine turned out great, even w/simmering for 2 hours. You did see my tip that 7 lbs of cucumbers was roughly equivalent to a 14 lb grocery sack full of large cukes? 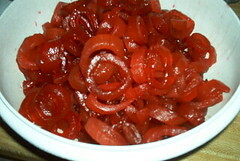 Once they are peeled/cored, they lose half their weight. Wish I had more ideas for you…let me know if you figure out what happened! They sure are delicious when they turn out! Hi Shirley, I don’t think it matters which vinegar you use…I’m pretty sure I used white though. HTHs! I’m on day 2 and they are an hour into simmering! My mom used to make these when I was young and found they recipe in her beautiful penmanship after she passed away two years ago. I can’t wait and have my fingers crossed they will be as good as I remembered! I have all the girls at my office wanting to try them and I want my husband and daughter to sample a bite of my “childhood”! Thanks for the waterbath explanation I was getting ready to ask myself. I made mine into skiiny spears- I think the next batch will be the circles though! I’ll let you know as my fingers stay crossed! I hope your family and friends love this edible slice of your childhood! I am getting ready to try your Cinnamon Cucumbers and the ingredient list says 1 cup of vinegar and then 2 cups of vinegar. In step 6, you say to use 2 cups of vinegar and in step 9 you state 2 cups again. Is it 2 cups and 2 cups or is it really supposed to be 1 cup and 2 cups? Just wondering before I try these out. I have some very large cukes that I am wanting to use up and this sounds like a nice Christmas gift. These are not only delicious, people love to get them, they’re so unique! I am on Day 1 with the cinnamon pickles. I have wanted to make these for years and finally am. I do not have quite 3 cups of vinegar on hand. Would it make a difference if I used 1 cup of vinegar and then 2 cups of cider vinegar in the syrup? On the post about the mushy cukes, did Laura stir the lime mixture often? The lime will settle and if not stired, it doesn’t always do its job throughly. My recipe is one that has been handed down from years ago. It calls for approx. 1 gallon of cucumber circles, 2 cups of lime and 10 cups of sugar. Thanks for reminding me about these pickles! You are welcome for the reminder…how do we forget these cherished oldies but goodies? I do it too! I’m not sure about swapping cider vinegar for white…it’s a lot of work if it doesn’t turn out right. I’d probably run to the store for the right stuff…but if you decided to go ahead and make it with the two kinds, let us know how it turns out! I’m sorry I didn’t see this comment till it was too late to weigh in on the subject. Hope they turned out great for you! A friend of mine introduced me to these delectable yummies! They are so suitable for a side with meat and potato meals, but especially those holiday meals 🙂 Thanks for sharing your recipe! You are welcome, Gina…they are always a curious talk-piece when company comes over! And yummy, yes!